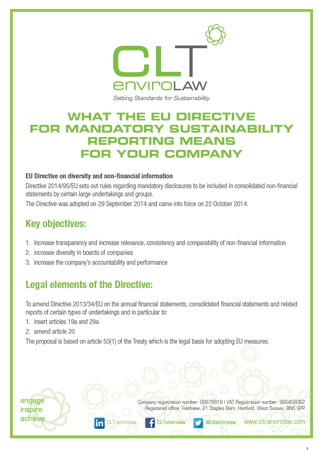 Directive 2014/95/EU (‘NFRD”) on non-financial reporting came into force on 22 October 2014. Member states had until the 6th of December 2016 to transpose the NFRD. 46a sets rules for content of corporate governance statement to be prepared by listed companies. The NFRD sets out rules regarding mandatory disclosures to be included in consolidated non-financial statements by certain large undertakings and groups. It applies to companies whose employees exceed 500 and whose balance sheet exceeds a total of 20 million euros or a net turnover of 40 million euros. The objectives of this directive are to increase transparency of non-financial information, diversity in boards and a company’s accountability and performance. Organisations have to disclose information relating to: environmental, social, employee related matters, respect of human rights, anti-corruption and bribery including a description of the company’s policies, the results and the risk related aspects.